Limited Availability - See Size menu for quantities. - Krampus is the dark companion and counterpart to Santa Claus. He is the one who not only punishes naughty children, but throws them into the sack he carries on his back, and takes them to an unknown fate. 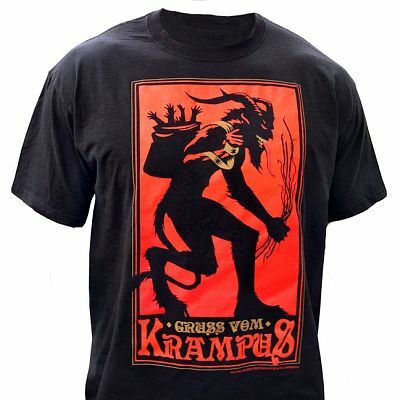 Our hand printed t-shirt is a very well researched depiction of Krampus indeed. If you look closely you will see that Krampus has one Human Foot, and one Animal Foot… this is a very authentic and traditional detail that you just won't see on other modern Krampus designs. 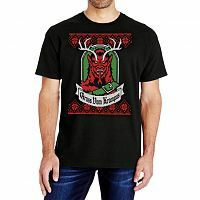 The "Gruss Vom Krampus" or "Greetings from the Krampus" text on this fashion t-shirt is an homage to the popular Krampus Greeting Cards of the 1800's. This amazing piece is hand printed in short runs by Michael Shaffer, art by Pat Sandman. Choose Size... Small - Only 1 left! Medium - Sorry, Sold Out! Large - Only 2 left! X-Large - Only 1 left! 2X-Large ($24.00) - Sorry, Sold Out! 3X-Large ($24.00) - Sorry, Sold Out! 4X-Large ($24.00) - Sorry, Sold Out! 5X-Large ($24.00) - Sorry, Sold Out! Please choose the Size. 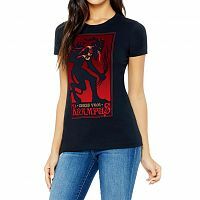 Do you have any other questions about our Krampus T-Shirt? Great quality shirt, never heard of the company before so I just figured id try it out. Will be buying from again. Prompt service and great quality t-shirt. I, too appreciate the t-shirt arriving in a ziplock bag.Thank you. I ordered 2 Krampus tee shirts in different sizes. I received my order much more quickly than I thought I would and it was in perfect condition! I was really impressed that each Tee was in a ziplock bag for protection. The graphics on these shirts are amazing! Love them and just might order one for myself!!! 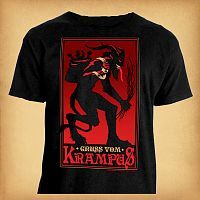 Best Krampus shirts I've seen!!! And the service is awesome! Thank you so much!!! The shirt graphic is so detailed and the silk screen appears to be phenomenal as well. I have t had a chance to wash it and update you in my next purchase. Many of my friends do not understand why they can not get this in a Black long sleeve Tee-shirt, or in a Black Sweat Shirt, after all it gets very cold come KRAMPUS Season, in Georgia! That's because the maker of this outstanding shirt doesn't offer it at this time. Most of think he has hit a gold mine and should even do caps! If you like your shirts old school, bigger. You need to buy One Size up. Mine fits like a gem and I will be buying another as a backup. The red is a nice nice KRAMPUS Red. Best shirt I have seen either on line on in the stores. Thank You so much for incredible quality and pricing.